I like to think, listen to all kinds of music, compose, tap dance, write, draw, collect things, make puns, brag, show up my father, and play scrabble. 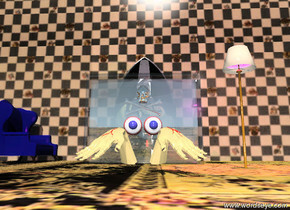 I was the only teen on Wordseye for a good number of months. You Saw Mommy Doing WHAT??? three deer are on the house. the deer are facing left. the ground is white. 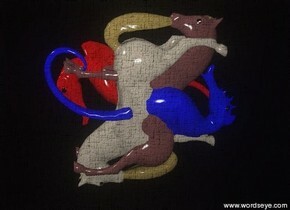 the wooden sled is to the right of the three deer. the wooden sled is facing left. santa is in the sled. the DUD of the sled is wood. the boy is in front of the house. the businessman is 10 feet in front of the FDOORS of the house. it is night. 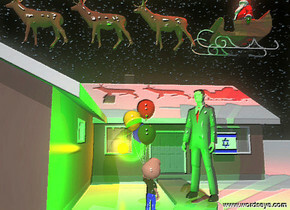 the giant green illuminator is in front of the businessman. it is to the left of the businessman. the giant red illuminator is 4 feet above santa. the roof of the house is shiny. the sun is dark. the boy is inside the giant green illuminator. the boy is facing northeast. 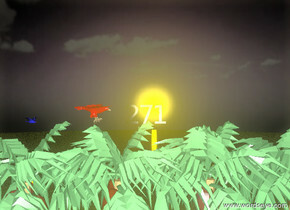 the businessman is facing southwest. the white mountain is 100 feet behind the house. the FURBOOTR of the santa is invisible. the FURBOOTL of the santa is invisible. the large israel is 8 feet behind the businessman. the large israel is 2.5 feet above the ground. the large israel is 3 feet to the right of the businessman. the roof of the house is white. 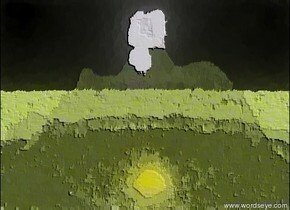 th gold light is 8 feet to the left of the israel. the flat glass swimmer is on the water ground. the cap of the swimmer is red. the blue of the swimmer is red. the ground is 70% transparent. the sky is water. the 8 foot tall purple water drop is inside the swimmer. it is 90% transparent. 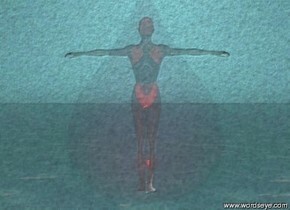 the red illuminator is two feet in front of the water drop. the light red light is on top of the dark red light. the dark orange light is on top of the light red light. the bright orange light is on top of the dark orange light. the bright yellow light is on top of the bright orange light. the ground is invisible. the sky is overcast. the shiny black translucent wall is -4 feet to the right of the dark red light. the camera light is blue. 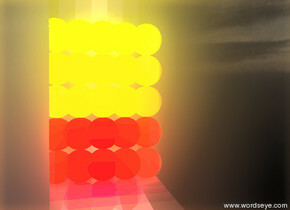 the large red light behind the translucent blue wall. the blue wall is 6 feet wide. the large blue light is on the red light. the large green light is on the blue light. the large yellow light is on the green light. the 6 foot wide translucent green wall is to the right of the red light. it is facing right. the huge blue light is 15 feet in the red house. the 7 foot tall shiny foot is 30 feet in the house. 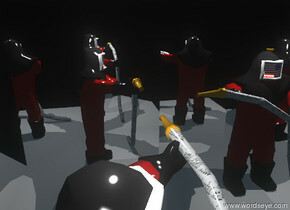 three small shiny blue men are in the dark red stage. the ground is fire. 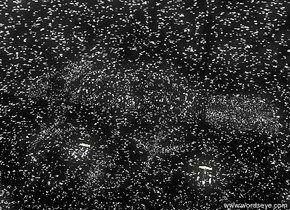 the sky has a starfield texture. 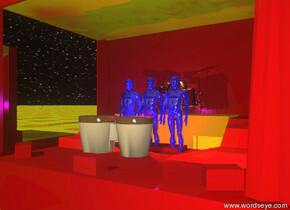 the 1.5 foot tall drum is in front of the shiny blue man. the small silver drum is 1.2 feet behind the small shiny blue men. it is -1.6 feet above the small shiny blue men. the platform of the stage is orange. the RAMPS01 of the stage is red. the mesh of the stage is fire. the large silver wall is to the left of the stage. it is facing right. the second large silver wall is to the right of the stage. it is facing left. the purple illuminator is 1 foot in front of the drum. 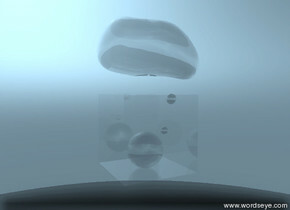 the tiny glass sphere is inside the small glass cube. the ground is invisible. the tiny glass speech bubble is on the sphere. the brown horse is facing up. the tan horse is facing down. the ground is invisible. the sky is black. the brown horse is -8 feet above the tan horse. the 8 foot tall red seahorse is -6 feet above the brown horse. it is facing down. the 8 foot tall blue seahorse is -6 feet above the brown horse. it is facing up. the enormous white seahorse is -3.2 feet above the business man. the seahorse is -11 inches in front of the man. the sky has a starfield texture. the ground is dark water. it is cloudy. 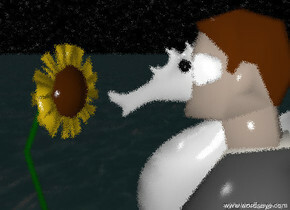 the 3 foot tall sunflower is in front of the seahorse. it is facing the seahorse. the huge red fetus is -3 feet above the tan swimmer. the swimmer is 70% transparent. the ground is invisible. the REYE of the swimmer is red. the LEYE of the swimmer is red. the sky has a starfield texture. the tiny orange illuminator is in the swimmer.the sun is black. the cube is to the left of the island. 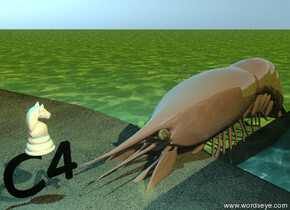 the 6 foot tall shiny prawn is 56 feet to the right of the cube. it is facing the cube. it is in the ground. the ground is water. the island is sand. the small black "C4" is to the left of the prawn. it is -1.7 feet above the island. the checkerboard wall is 5 feet in front of the prawn. the sun is gold. the LPREYEL of the prawn is stained glass. the LPREYER of the prawn is stained glass. the huge marble knight is on the "C4". the knight is facing right. the cyan illuminator is 4 feet above the knight. the tan man is glass. the red stomach is -2.1 feet above the man. the .5 foot tall liver is -8 inches above the stomach. 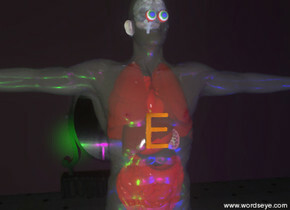 the red intestine is below the liver. the intestine is small. the small kidney is -2 inch to the right of the liver. it is 4.1 feet above the ground. the maroon lung is 4 inches in the liver. the small brain is 4.2 inches above the lung. the bright red internal organ is 8 inches in the lung. two green eyes are in front of the brain. the 2 inch tall tan ear is to the left of the brain. it is -1.5 inches below the brain. the ground has a floor pattern. the huge brown wall is 10 feet behind the man. the tiny stained glass "E" is .5 inches in front of the lung. the sun is black. the purple illuminator is 3 feet in front of the man. 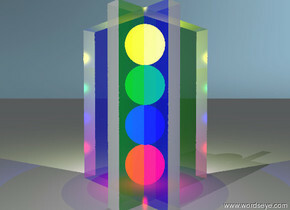 the green illuminator is 2 feet to the left of the purple illuminator. the blue illuminator is 2 feet to the right of the purple illuminator. the sky has a starfield texture. 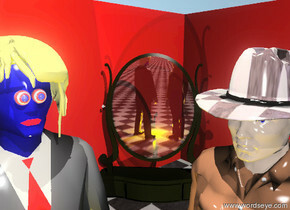 the large wooden mirror is in front of the wall. the mirror of the mirror is silver. the stained glass moose is on the sand ground. the large santa is inside the moose. the Eyel of the santa is cyan. the eyer of the santa is cyan. 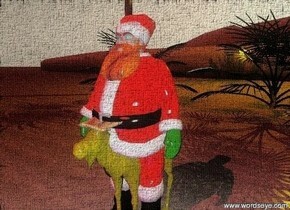 the beard of the santa is stained glass. the huge sand mountain range is 150 feet behind the santa. the sun is red. the sky is tan. a blue light is ten feet in front of the santa. An enormous Orange light is 100 feet behind the santa. It is 50 feet above the ground. five large palm trees are 20 feet behind the santa. the small red car is on the giant freeway. the small blue car is on the giant freeway. the small blue car is 2 feet to the right of the small red car. the column of 3 small cars is 6 feet behind the small red car. the small blue car is facing back. the column of 4 small cars is behind the small blue car. the column of 4 small cars is facing back. 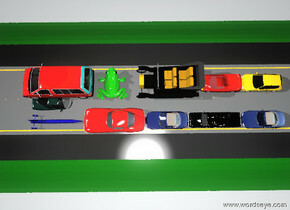 the enormous green frog is behind the small red car. the frog is facing left. the red chair is inside the van. 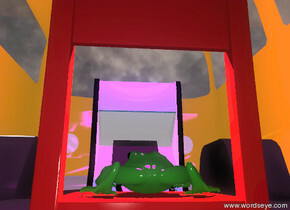 the large green frog is on the chair. the huge video-game-vp13385 is in front of the chair. 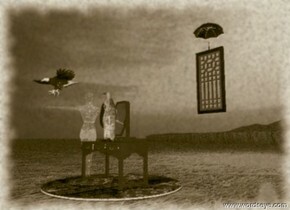 the video-game-vp13385 is facing the chair. the BODYGLAS of the van is glass. it is very cloudy. the doorglass of the van is glass. the purple illuminator is above the chair. the ground is invisible. the silver blimp is on the ground. five silver airplanes are ten feet behind the blimp. ten enormous entirely silver cars are 30 feet behind the airplanes. the sky has a starfield texture. the enormous red illuminator is 100 feet left of the blimp. the enormous blue illuminator is 100 feet to the right of the blimp. the enormous purple illuminator is 100 feet above the blimp. the cyan skull is 5 feet in front of the giant silver Jukebox. the rose is facing down. the skull is one foot above the ground. the skull is facing the jukebox. the second giant jukebox is 5 feet in front of the skull. the second giant jukebox is facing up. the sky has a starfield texture. the red illuminator is behind the skull. it is two feet above the skull. 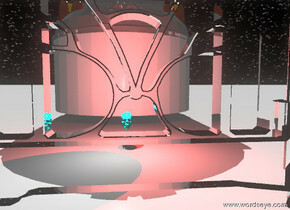 the cyan skull is 5 feet in front of the giant silver rose. the rose is facing down. the skull is one foot above the ground. the skull is facing the rose. the second giant rose is 5 feet in front of the skull. 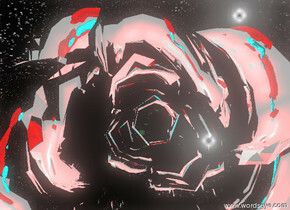 the second giant rose is facing up. the sky has a starfield texture. the red illuminator is behind the skull. it is two feet above the skull. three huge water drops are on the rose. 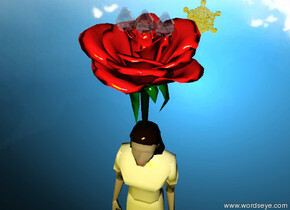 the rose is on the small woman. the torso of the woman is white. the rsleeve of the woman is white. the lsleeve of the woman is white. the skirt of the woman is white. the ground is silver. the giant snowflake is ten feet behind the woman. it is partly cloudy. the sun is gold. 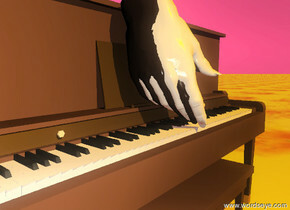 the huge ivory hand is on the WHITE_KEYS of the piano. the huge ebony hand is on the BLACK_KEYS of the piano. the ground is fire. the sky is crimson. the sun is orange. 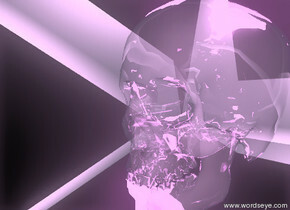 the violet glass skull is inside the giant silver tetrahedron. 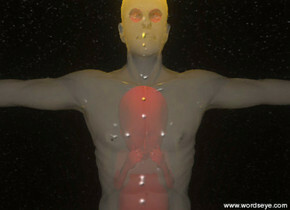 the violet illuminator is inside the skull. the large ivory skull is -4 feet above the huge silver dodecahedron. 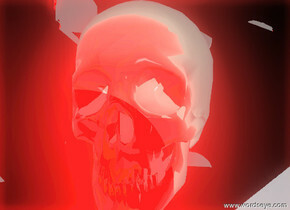 the red illuminator is behind the skull. the skull is facing backwards. the small blue illuminator is to the right of the skull. the small green illuminator is to the left of the skull. the large ivory skull is inside the giant silver dodecahedron. it is 2 foot above the ground. 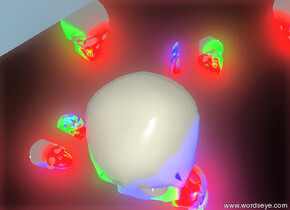 the red illuminator is in front of the skull. the fireman is inside the enormous silver cube. the 9 foot tall silver wall is -4 feet to the left of the fireman. it is facing the northwest. the second 9 foot tall silver wall is -4 feet to the right of the fireman. it is facing the northwest. the FACEPLATE of the fireman has a flag texture. 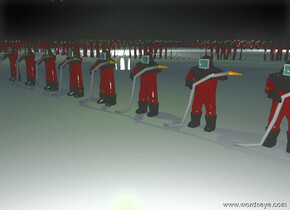 the HOSE of the fireman has a "Justice" texture. the "Justice" texture is 3 inches wide. the illuminator is 1 foot above the fireman. the boy is inside the giant "O". the "O" is a floral pattern. The Giant "N" is 1 foot to the left of the "O". 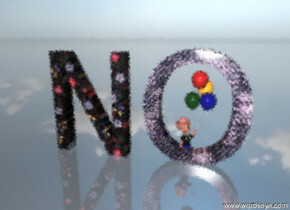 the "N" is a floral pattern. the ground is glass. It is partly cloudy. The sun is red. ten tiny firemen are inside the huge silver cylinder. the cylinder is 20 feet wide. the tiny chartreuse illuminator is 2 feet above the ten tiny firemen. the small lion is on the chair. the sky is cloudy. the sun is black. the tiny red illuminator is 2 feet in front of the chair. the red illuminator is 3 feet above the ground. the talk balloon is to the left of the lion. the talk balloon is facing back. the talk balloon is 3 feet above the ground. 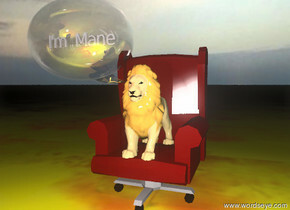 the tiny "I'm Mane" is 6 inches in the talk balloon. the "I'm Mane" is facing forward. the ground is fire. the sword is in the huge king of hearts. the ground is fire. the blade of the sword is shiny. the huge queen of spades is to the left of the king of hearts. the 5.9 inch tall bed is on the queen of spades. the huge jack of spades is to the right of the king. the 1 foot tall pirate is on top of the jack of spades. the huge ace of spades is in front of the king of hearts. the 1 foot tall death is on top of the ace of spades. it is facing the sword. the sky has a starfield texture. the .7 foot wide "Zach" texture is on the shirt of the boy. the man is 1 feet to the right of the boy. 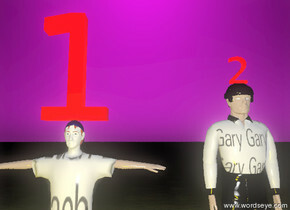 the .7 foot wide "Gary" texture is on the torso of the man. the large red "1" is on the boy. the small red "2" is on the man. the ground is stained glass. the sky is dark purple. the sun is black. the gold illuminator is 5 feet in front of the boy. the humongous playing-card-img-iz1305 is in the huge mountain. the mountain is shiny glass checkerboard. the sky has a starfield texture. 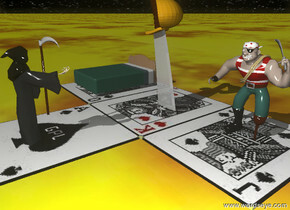 the 10 foot tall die is 3 feet in front of the playing-card-img-iz1305. it is 5 feet below the playing-card-img-iz1305. the cyan light is to the left of the die. the purple light is ten feet in front of the die. it is ten feet below the die. the giant gold light is inside the mountain. the ground is grass. 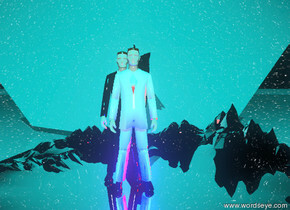 the white man is on the extremely tall silver mountain range. it is partly cloudy. The mountain range is 20 feet wide. the humongous silver dodecahedron is 2 feet behind the man. the sky has a starfield texture. the sun is cyan. the bright red illuminator is behind the man. the bright blue illuminator is in front of the man. the black man is behind the man. the ground is ice. there is a shiny dodecahedron in front of the huge rainbow group-vp8331. there is a gold illuminator in front of the shiny dodecahedron. there is a red illuminator above the gold illuminator. the ground is silver. it has a checkerboard texture. the checkerboard texture is 20 feet wide. the giant unreflective checkerboard wall is ten feet behind the group-vp8331. the sun is dark. 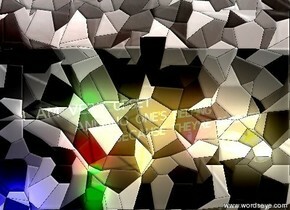 the large pattern shape is on top of the texture object. the ground is cloth. the sky is fabric. the sun is dark. the cyan illuminator is in front of the large pattern shape. 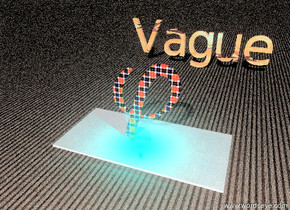 the large texture "Vague" is ten feet behind the texture object. the skull is inside the head of hair. the 1.3 foot tall helmet is in the skull. the tiny silver skull and crossbones symbol is in front of the skull. it is .6 feet above the ground. a row of two large eyes are below the tiny skull and crossbones symbol. the steeth of the skull is gold. the jteeth of the skull is gold. the small television is inside the skull. the screen of the television is glass. the cabinet1 of the television is glass. the cabinet2 of the television is glass. the small hand is .5 foot in front of the television. the DIRT8 of the hand is invisible. 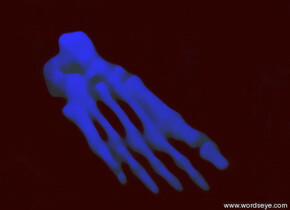 the STONE13 of the hand is invisible. The CROSS1 of the hand is invisible. the CROSS2 of the hand is invisible. the STRAP of the hand is invisible. the STRAP2 of the hand is invisible. the GRASS of the hand is invisible. the ground has a rug texture. the small wall is behind the television. it has a wallpaper texture. the wallpaper texture is 4 feet tall. the tiny chair is .7 foot to the left of the television. it is facing east. the tiny lamp is .1 feet to the right of the television. it is .5 feet in front of the television. the tiny bright purple illuminator is in the lamp. the dark red illuminator is ten feet in front of the hand. the penguin is on the table. the ground is grass. the sky is cyan. the penguin is facing left. it is stained glass. the woman is to the left of the table. she is facing the penguin. the rug-img-iz1556 rug is under the table. it is cloudy. the mountain range is 100 feet behind the table. the mountain range is grass. the eagle is 3 feet to the left of the penguin. it is 6 feet above the ground. the window is ten feet behind the table. it is 5 feet above the ground. the woman is baby blue glass. the black umbrella is on the window. the huge orange illuminator is ten feet behind the window. the blue illuminator is 2 feet below the top of the woman. 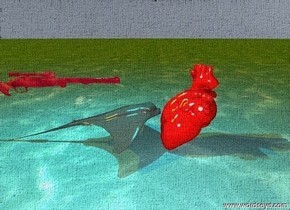 the sting ray is in front of the giant red heart. the sting ray is facing the heart. the ground is water. the sky is baby blue. the cyan illuminator is 3 feet above the ray. the stained glass rifle is 2 inches above the sting ray. it is facing the heart. it is 1 foot in front of the heart. the sun is orange. the "I AM VERY UPSET" is 1 foot above the "AND NO ONE'S HELPING". The "AND NO ONE'S HELPING" is 1 foot above the "BECAUSE THEY'RE CONCEITED" the ground is black. The sky is dark red. The sun is yellow. It is cloudy. the huge green illuminator is behind the "I AM VERY UPSET". The huge orange illuminator is behind the "AND NO ONE'S HELPING". It is 5 feet to the right of the huge green illuminator. The huge brown illuminator is behind the "BECAUSE THEY'RE CONCEITED". It is 5 feet to the right of the huge orange illuminator. The huge red illuminator is 1 feet below the huge green illuminator. the giant blue illuminator is to the left of the "I AM VERY UPSET". the 10 foot tall hand is 5 feet in front of the "BECAUSE THEY'RE CONCEITED". it is facing up. the golden illuminator is above the hand. there is a column of 5 palm-tree-vp1389. the sky is purple. it is dawn. the sun is gold. The ground has a grass texture. the grass texture is 8 feet wide. the giant blue bird is 30 feet to the right of the tree. It is 38 feet above the ground. the huge red bird is 12 feet in front of the blue bird. it is partly cloudy. the huge black "271" is 5 feet in front of the red bird. the "271" is facing left. the shiny red card is facing the shiny blue card. The shiny green card is facing the shiny yellow card. the small floor is rainbow. the blue card is facing the red card. It is .5 feet in front of it. The yellow card is facing the green card. It is .5 feet in front of it. the red card is on the floor. the green card is on the floor. 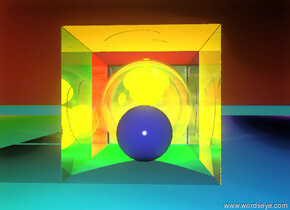 the small glass sphere is in front of the red card. the tiny gold light is inside the sphere. The sky is maroon. The sun is silver. The tiny blue sphere is to the left of the light. 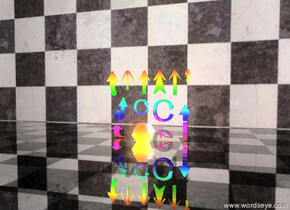 the purple card is facing down. It is on top of the small glass sphere. the ground is rainbow. the orange card is facing down. it is to the left of the purple card. the shiny .5 foot tall stained glass wall is to the right of the small glass sphere. it is facing the sphere. it is .5 feet wide.